I’m really excited to finally show you an inside look into our learning activities! I feel like it’s been a while since I’ve really done a post like this. This week, we spent some time discussing farm themed works and activities. Today, I’m going to show the works we used with Y (5 years old), but keep a look out for the matching activities (toys) I prepared for N, as well! Age: You can use these activities for children approximately between the ages of 3-6. We did this a few years ago and y loved it! Since then, we have gone on visits to farms. It’s so wonderful to see things we learn about at home being experienced in the real world by Y. We live in a rural area, surrounded by farms, so things like this are pretty easy (and so fun) to arrange! Fill the glove with water and tie the end shut with a thick knot. Make sure it is secure. Do not make it too full. Hold the glove by the fingers so the water is on the other end. Use the push pin to poke small holes in the fingers of the glove. Hold the glove in one hand, fingers now pointing down. Demonstrate to the child how to squeeze water out of the glove. While you are giving the demonstration, it is best to avoid talking too much. Usually, when I am showing my children something, I let them focus on whatever it is that I am doing. Before or after, it may be nice to discuss what is happening and why. In this case, you can say the glove resembles a cow’s udder. Y doesn’t like to be photographed so I don’t have an action shot of this one, but Y loved, loved, loved it! I put a blindfold on him, and asked him to pick an animal. He had to tell me what it was. He kept asking to do this one over and over! We used these beautiful farm animal 3 part cards from Mama’s Happy Hive! I love the isolated, real images on this set of materials! The images are very beautiful! You can get these beautiful printables from Mama’s Happy Hive! Here, we used only the pig and cow. First, Y tried writing the words using the movable alphabet. Even though the alphabet is normally presented with all of the letters, I selected only the ones Y needs for these two words. I set up a simple beginning sound work for Y. We are working hard on letters and reading lately. I asked Y to match the farm animals to their beginning sound. You’ll also love our farm books for kids! We used the Animals and Their Products printables from my farm printables set for this activity. The cards consist of assorted animals and the products they make. Pretty self-explanatory, huh. Just, ask your child to sort cards based on the animals and the products they make! Present the work by placing the animals and products separately. Take all of the animal cards and lay them out in front of your child. Pick one product. Place it underneath the first animal. Does it go together? If not, move onto the next animal. Does this product correspond to the animal? If yes, place the card underneath the animal. Take another product. Do this until all of the products are underneath the corresponding animal. 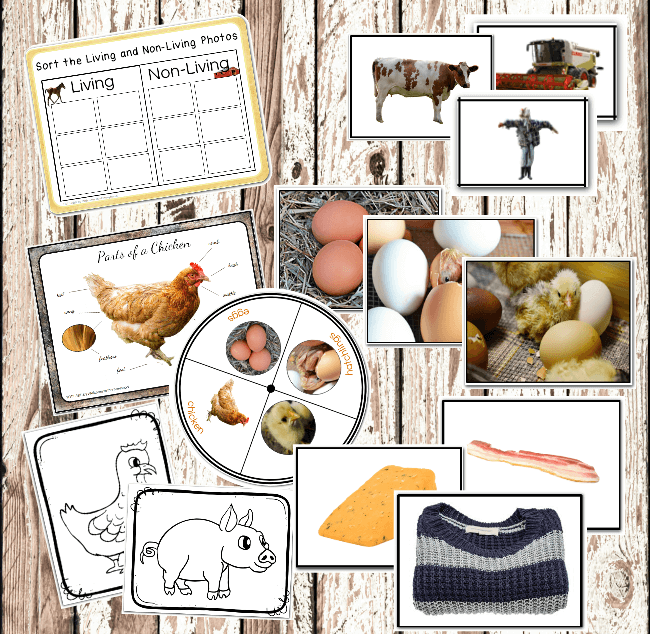 We used the printables from my Farm themed printables bundle to explore the life cycle of a chicken. I created a simple set of Chicken Life Cycle materials. These used only real images so your child can really understand the different phases. Y was so fascinated to learn how a hatchling looks after leaving it’s egg! Three part cards like these are really great for helping children to absorb and retain new information. I really like to use them for these sort of themed units with a lot of new content for Yvann. You can read about how my friend Vanessa used these printables to create some awesome felt chicken life cycle activities! We used the printables from my Farm Animal Craft Pages to make your own animals! 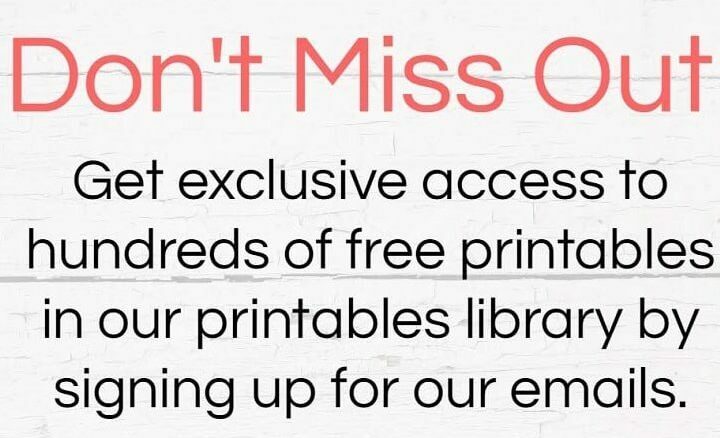 Get your set of Farm Themed Printables Bundle! Visit Mama’s Happy Hive for some awesome felt chicken life cycle activities!